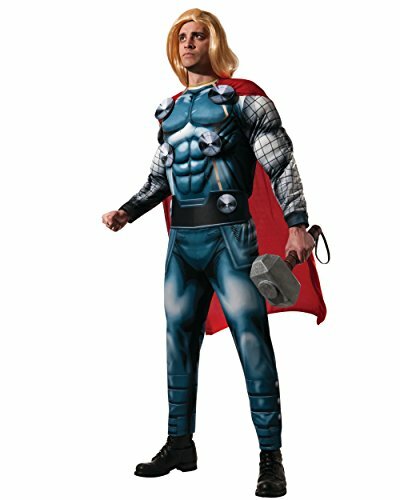 This deluxe Thor outfit is a fun and trendy costume idea for this Halloween. Marvel's properties are hotter than ever and going as a superhero from the Avengers is a popular choice. Add the essential accessory and you'll be ready for a night of saving the world. This deluxe costume includes a molded jumpsuit with 3D effect muscles all over to give the wearer a true bulked-up God of Thunder look. The Thor jumpsuit comes with a matching red cape. You'll also get a nordic-style blond wig to complete your look. Note that Thor's Hammer is sold separately. You wouldn't be able to pick it up without having the outfit first, anyway.